In 2000, this innovative concept emerged, with the firm intention of capturing and fostering this wonderful art created by the Mayan Culture, formed by all those traces of expression that left their way through southern Mexico. 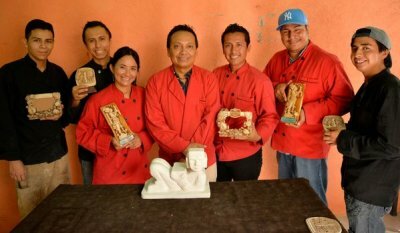 We seek to transmit the identity and passion of our Mayan Culture to visitors who arrive in this region, granting them an original sculpture that reminds them of their stay in Cancun and La Riviera Maya. We are manufacturers with extensive experience in the market directed to the field of Groups, Conventions, Travel Agencies, Vacation Clubs and Hotels in the development of a wide variety of products, such as gifts, recognitions, magnets, charms, portraits, card holders and many more .